Following the Mossack Fonseca leaks, as well as many other scadals before it, is offshore banking necessarily a criminal activity? Somehow, 11.5 million files from Panamanian law firm Mossack Fonseca were leaked to the Süddeutsche Zeitung who in turn shared them with other newspapers, including The Guardian. The files revealed some famous names as clients, in particular political leaders such as Iceland’s Prime Minister Sigmundur Davíð Gunnlaugsson, cellist Sergei Roldugin, who is closely associated with Russian president Vladimir Putin, and the family of former Egyptian president Hosni Mubarak. Repercussions are just starting, with the question being asked: Why exactly did these people need to hide their wealth offshore? Indeed why does anybody need to hide their wealth offshore? There are many ways ways of analysing this question, so let’s break it down three ways. In a highly solvent, regulated and economically stable country like the G10 countries, we might argue that there is no need to hold wealth offshore. What problem might be solved by doing this? If the answer isn’t anything illegal, then it’s probably to do with tax efficiency, or maybe the desire to hold more than one currency or it’s to do with a lack of faith in ones local banking system. These might be weak arguments but if that’s somebody’s honest position then an offshore account might just be a solution. Risk diversification became evident in the banking crisis of 2007-2010. Although many onshore banks remained solvent, Icelandic banks in particular suffered insolvency, and Cyprus stayed afloat only through the expropriation of depositors’ assets. Indeed the Cypriot solution demonstrated a little-known fact, and that is that depositors are really creditors. A bank does not keep depositors’ money in a safe. Not even in a digital version of a safe. Depositors’ money becomes bank assets, and the amount shown on bank statements becomes banking liabilities. Partial expropriation of depositors’ assets is really offering creditors a percentage settlement. So perhaps it’s wise not to keep one’s wealth in one bank or even in one jurisdiction. 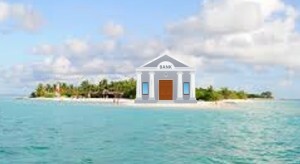 Banking laws vary from state to state, and some of the most liberal banking laws are found in island nations (hence “offshore”), often British dependencies like the Cayman Islands and the British Virgin Islands. Of course sovereign risk diversification need not involve offshore tax havens, and we would be right be be cynical to assume they offer the degree of diversification that justifies moving wealth to a small island jurisdiction. Why not to a North American or EU country? For those who live in a less economically developed nation, it makes more sense to keep wealth in a jurisdiction that know what it’s doing, in a currency that isn’t likely to experience hyper-inflation or exchange restrictions. This is where the liberal banking laws of offshore banking centres appear especially attractive. And this is why wealthy leaders of countries like Egypt and Syria keep their wealth well away from their home nations. I once considered opening an offshore banking account, in the Isle of Man. I was even about to sign the forms at my local bank, who offered the service through a subsidiary, until I found out that the online offering fell short of what I needed! My thinking was to keep money in currencies other than pounds sterling, to be spent overseas without being brought back onshore (and taxed). Was there anything criminal or shady about that? No doubt banks will all tell you that tax evasion is illegal in any jurisdiction. Earning income offshore and not paying income tax on it is wrong both legally and morally. More complex transactions involving borrowing and depositing assets offshore to avoid all kinds of taxes is certainly illegal and law firms like Mossack Fonseca are no doubt advising their clients on how to keep one step ahead of the various tax collecting jurisdictions around the world. Whether schemes are avoidance or evasion (one is legal, the other isn’t) are open to debate, and tax loopholes are forever being closed. Nevertheless, evasion is a known problem. The UK’s revenue collecting agency, HMRC, estimates several billion of tax revenue which is outstanding in offshore jurisdictions, with £5 billion in Switzerland alone. Although hiding assets in places like Switzerland and the British islands is becoming harder with the imposition of banking transparency agreements, other jurisdictions might not be quite so cooperative. Tax evasion will doubtless continue for as long as money can find a secure hiding place. Would wealthy individuals risk their assets being banked in less stable jurisdictions to avoid paying taxes? Probably not, unless they are ill-gotten gains in the first instance. And this brings us to the last category. Where does money from drug cartels, fraudsters and political leaders who accept bribes end up? The task here is not to avoid paying tax, it’s to avoid being associated with the assets at all. And it’s not restricted to offshore accounts either, with HSBC now being sued by families of victims of Mexican drug cartels whose money they laundered, for example. We can only guess what might be lurking in places where the authorities have yet to turn their attention. Money laundering involves placing the illegally-gained money in accounts and assets which are legal and which can be easily moved from bank to bank just as legal money might be. The identity of the account holders is shrouded behind trusts, nominee accounts and organisations or individuals acting on the criminals’ behalf. Is the extent of these criminal activities enough to justify clamping down on offshore banking accounts? Clearly the offshore states in question say not. And it’s the same argument that sees onshore authorities suspicious of Bitcoin. It might be that even without offshore banking centres, the proceeds of crime can still be laundered digitally without the use of banks at all. I have sketched out (and with apologies to Sergio Leone) the Good, the Bad and the Ugly aspects of offshore banking. Perhaps it’s not the fact that the activities are offshore that’s the problem, it’s the fact that money, or rather currency, is itself an anonymous storage of wealth. Central banks are already looking at imposing a digital currency on us, thus tracking the movement of money between account holders in a way that’s not currently possible. Ostensibly this idea isn’t to crack down on tax evasion or money laundering, but to avoid having to print banknotes and even to impose negative interest rates. But perhaps it will just drive assets into Bitcoin or gold. For light relief, here’s The Members from 1979 singing Offshore Banking Business.